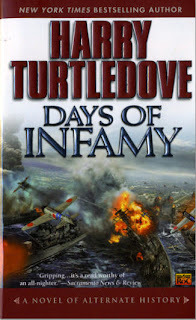 In DoI, Turtledove examines an alternate timeline where Japan, instead of just raiding Pearl Harbor on 07 Devember 1941, successfully invades and occupies the islands of Hawaii. DoI is the first of two books on this (does that make it a 'bilogy'? ), covering the invasion and about 12 months after that. Turtledove is at his best when he's describing military stuff - the planes, the ships, and the strategies that would be involved in conquering Hawaii. But beyond the fighting, he also looks at a number of other topics. Among them are : the racial stereotyping that both the USA and Japan were guilty of; the Hawaiians yearning for their own sovereignty again; the pull that one's homeland has, even when one has lived for decades somewhere else; the role that oil played in Japan's decision to attack the US, and how transient basic supplies are when 99% of life's necessities and luxuries are imported from overseas. Turtledove creates some interesting characters to follow. There's a Zonker-type surfer dude who doesn't let something like a war interfere with his catching that perfect wave. There's a Japanese father who finds an insurmountable generation gap between him and his two Americanized kids. Also, the Japanese fighters are not mindless zombies; nor are the American soldiers John-Wayne clones. Even the lackeys are shown to have redeeming points. The characters may be interesting creations, but they don't progress at all. The surfer and the fisherman go out to sea. And catch fish. Again and again. And again. Then there's the haole civilian woman who is forced to plant a turnip garden. Follow her adventures as she rakes, hoes weeds, battles bugs, and eats turnips. Again and again. And again. What fun. Also, while Turtledove does a good job examining the Japanese and American psyches, he doesn't create any Hawaiian characters, outside of a few royalty figures making cameo appearances. That's a significant omission, given that the setting is Hawaii. To steal a punchline from Ambrose Bierce, "The covers of this book are too far apart." Only about 20% of the book is Alternate History. The rest is character study. Hey Harry, if I wanted character study, I'd be reading Tolstoy or Hawthorne or Steinbeck or something. What if Japan had conquered Hawaii? Well, I suppose I'll have to read the sequel to this to get Turtledove's opinion. But I'm betting Harry has us Yanks tossing them war-crimes-committing, Japanese so-and-so's back into the Pacific to become shark-food. And frankly, that would be my take on this Alternate Timeline as well. The dynamics of the Pacific fighting in WW2 would've been different, but not the outcome. In the long run, America's industrial might, larger population, and safe homeland means that we wouldn't lose. Personally, I think Japan could not have made a bigger mistake than attacking Pearl Harbor. If the Axis were going to win World War 2, instead of attacking the USA possessions, Japan should've invaded Siberia. Make the Russians fight on two fronts, and keep (or at least forestall) America from entering the war. After Russia and Great Britain fell, who cares what the USA does? But this is speculation for some other time. In summary, this is a typical Turtledove book. The concept is great, but there's too much drama, and not enough Alternate History. The plusses pretty much balance out the minuses here. And I'm beginning to come around to Amber's way of thinking - that certain literary genres are inherently only worthy of a "C" rating. yeah, they go out searching for them and sink all but one. at the end of this book, the Japanese have complete air superiority around Hawaii. according to Turtledove, the Zero was just a superior plane to the Mustang at the time. one gets the feeling that will change in Book 2. if i can motivate myself to go find it and read some more about turnip gardens.